It’s a very strange feeling to be in two places at one time. My body is firmly planted in my chair at work. My hands are on the keyboard, and my eyes are looking at my computer screen. But my mind is still in Eagle River, Wisconsin. 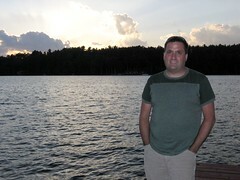 My friend Jeremy’s family owns a home on Cranberry Lake, which connects to Catfish and Eagle lakes via small connecting creeks. 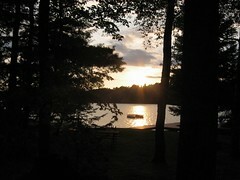 Along all of the lakes and creeks are homes of every size and shape– from the grandiose to the simplistic. But whether you’re rich, poor, or somewhere in between– your main reason for being there is to enjoy the gorgeous setting and relax. We were blessed with some absolutely gorgeous weather all weekend. The sun was warm, the air was cool, and the breezes were plentiful. We boated, laid in the sun, and enjoyed each other’s company without the need for thumping club music and computerized neon light displays; or smoky, dingy bars. Instead, for our nighttime entertainment, we were treated to a chorus of crickets, spectacular auroras in the north, glass-like waters on the lake, and a trillion brilliant stars in the sky. We arrived Friday afternoon after a six-hour car ride and immediately began to decompress from the stresses of city living. The sun was just starting to hang low in the sky, so we decided to take an evening cruise around the chain of lakes in the Eagle River area. Everyone waves as they ride past. A few even say hello. And once in a while, an ignorant few ask, “How come there’re no girls on your boat?” We just answer that we want it that way and continue on our journey. This was my second visit to Eagle River– the last being in August of 2005. We had six people up there last time and there were a different six this time. Each time we all came away with the same sense of peace and tranquility– something we can’t get living in the city. It’s something you can’t get from camping, either. It’s just– special. So in the next few days, as I re-adjust to city living, and the stresses and annoyances of life get their best of me, I will close my eyes and remember those stars. I’ll remember the brilliant sunsets. I’ll recall the wind in my hair while riding in a speedboat. I’ll reminisce about the trees and the grass and the wind blowing through it all. And, hopefully, I will relax… and realize that a city is not the entire world. There is so much more. All I have to do is stop and look– and pay attention.